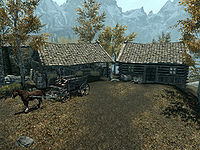 Riften Stables is a stable outside the northern entrance to Riften. It is owned and run by Hofgrir Horse-Crusher with the help of his assistant Shadr. A dappled grey horse can be bought for 1000 gold. The stables are just to the right of the main gate into Riften, with space for two horses in separate stalls. There is an empty cart and three barrels, two of which contain food and the third is a fish barrel that can contain raw salmon meat fillets, various small ingredient fish, clam meat and salt piles. To the right of the stables, among some trees is where a Khajiit Caravan lead by Ahkari camp when they are at Riften. There is also a gourd plant among the same trees and behind the stables towards the rear exit for Honeyside is a canis root plant near some rocks. There is also a carriage in front of the stables driven by Sigaar, who is willing to take you to any of the main cities and towns. Entering the stables takes you into the main living room, with a cooking pot against the opposite wall and a wall shelf above holding clutter. To the right of the cooking pot is a set of shelves holding a potion of minor healing, a potion of minor stamina, two boiled creme treats, a sweet roll, two cabbages, three loaves of bread, several pieces of cheese, a green and two red apples. There is a food barrel in the western corner. Against the northwest wall is a dresser with a bunch of lavender on top and a green apple on the floor in front. In the northern corner is a small square wooden table and two chairs, with a bottle of alto wine, a bottle of wine, a salmon steak, a loaf of bread and an eidar cheese wedge on the table and hanging from the ceiling above are two garlic braids, two bunches of elves ear and two bunches of frost mirriam. 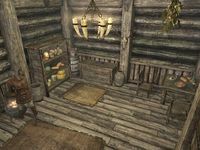 There are a pair of double doors to the southeast that open into a bedroom consisting of two single owned beds in the northern and eastern corners, with a medium coin purse and bottle of Nord mead under the eastern one and an unlocked chest containing minor loot, at the foot of the northern one. There is a wardrobe containing clothes and a barrel with an apprentice locked strongbox on top against the southeast wall. On the southwest wall is a wall shelf holding a bottle of wine and copies of Alduin is Real, An Explorer's Guide to Skyrim, Of Fjori and Holgeir, Cats of Skyrim, Watcher of Stones, A Gentleman's Guide to Whiterun, Horker Attacks and A Dream of Sovngarde. Northeast of the stables, the ruins of a small, round tower can found nestled among the rocky ledges of a large hill. Within the fallen walls sits a satchel and a Shrine of Zenithar atop a stone table, next to a long-dead skeleton. This page was last modified on 16 February 2018, at 10:56.